Craving chocolate? No problem, chocolate is actually healthy and tastes great. It's the sugar, milk, and other additives put into chocolate that are bad for you. 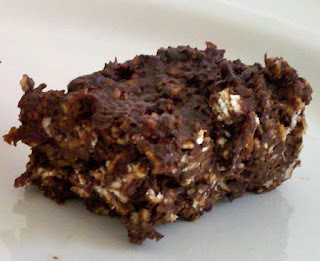 So, I got this no-bake brownie recipe from Dr. Oz's website. It uses raw cocoa powder, which you can get at a health food store or on Amazon. I know its not cheap but its the best way to satisfy your chocolate cravings. You can add the powder to smoothies or use in other dessert recipes. I'm actually going to try to make my own chocolate bars soon! In a food processor purée the cacao, cayenne, cinnamon, milk and raisins until a smooth paste forms. Add the oats to the food processor and quickly pulse to incorporate them. Transfer the mix into a square or rectangular container lined cross wise with wax paper. Press down to form the brownie base. Refrigerate until firm. Cut into squares before serving. Enjoy! Yes, I get enough protein! Need a snack? Make some kale chips!